All the fields need to be filled in. 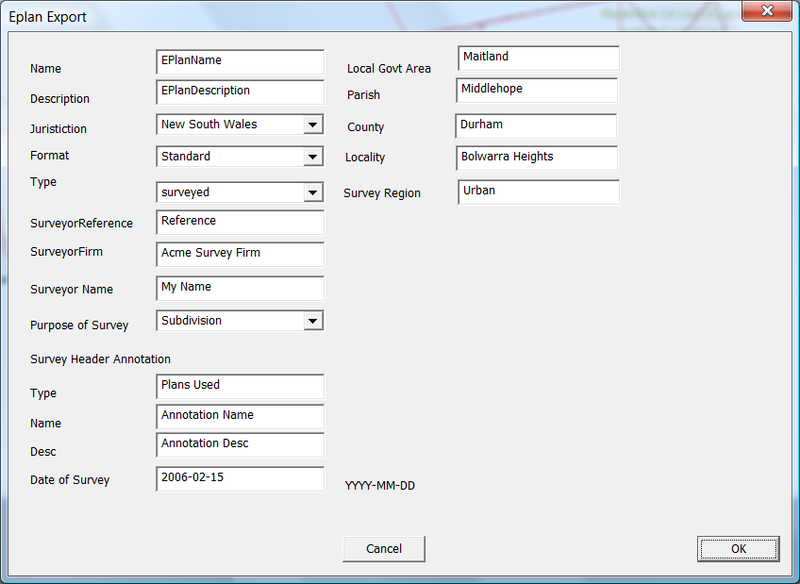 They are header type information needed for the ePlan LandXML to validate. Once you click OK you are prompted for a file name where the ePlan LandXML is to be created. You have now created an ePlan LandXML file. The next stage is to validate the file. We first suggest that you run the file through "XML Notepad". 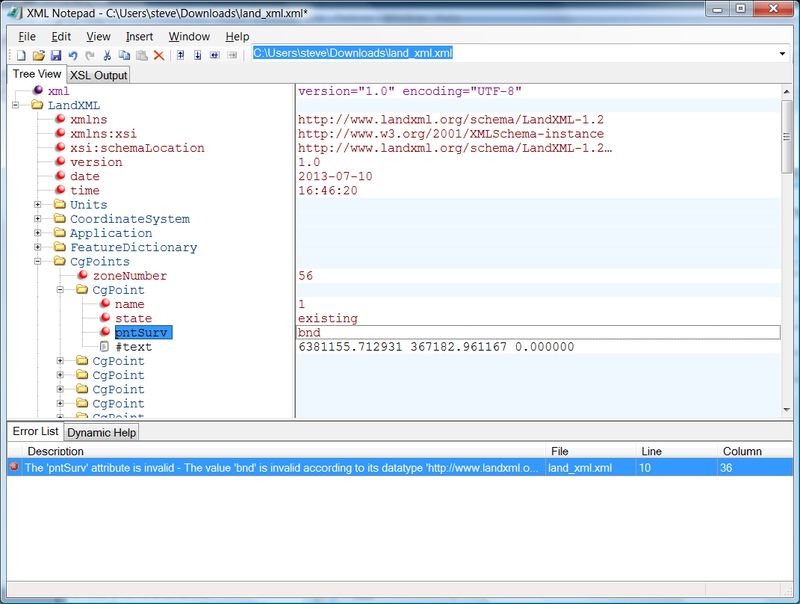 This editor will check that the XML validates to the version 1.02 LandXML Schema. In the file below we have purposely created an error in the file. 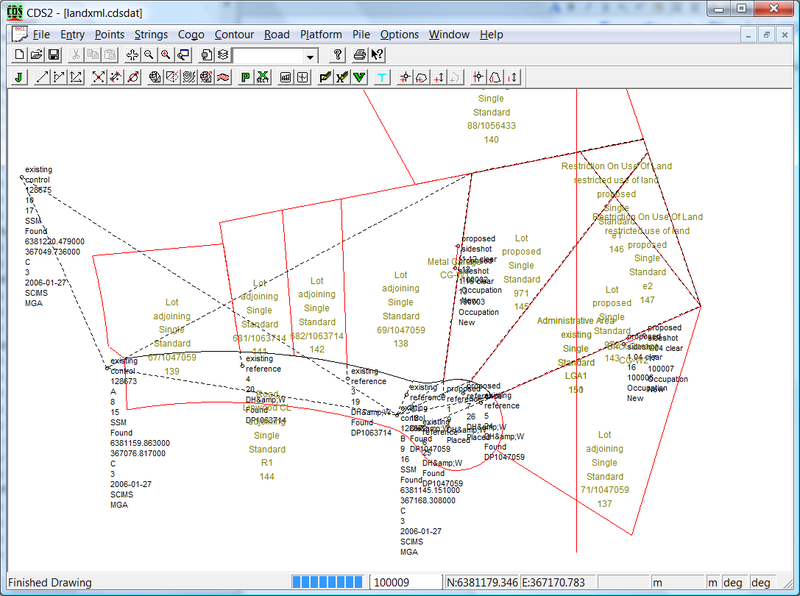 Along the left hand side we have a Tree View of the XML data. You can see the major headings for Units, Coordinate Systems etc. it will bring up a list of the allowable enumerations if available. In this case we can see the correct value should be boundary. 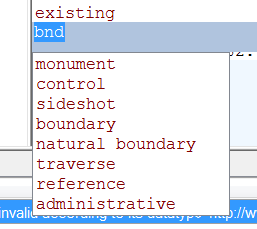 If we select boundary then the value will be updated. However we suggest that rather than update the created XML you go back to the original survey in CDS and correct it there. This way any changes will not be lost if you need to recreate the ePlan LandXML. Once you are satisfied the XML conforms to the 1.02 schema we are in a position to validate it against what ePlan NSW (or your state) requires. The ePlan NSW at present has a further 38 checks it performs. First click on the browse button and select the LandXML file that has just been created. Now click on the "Upload and Validate" button. 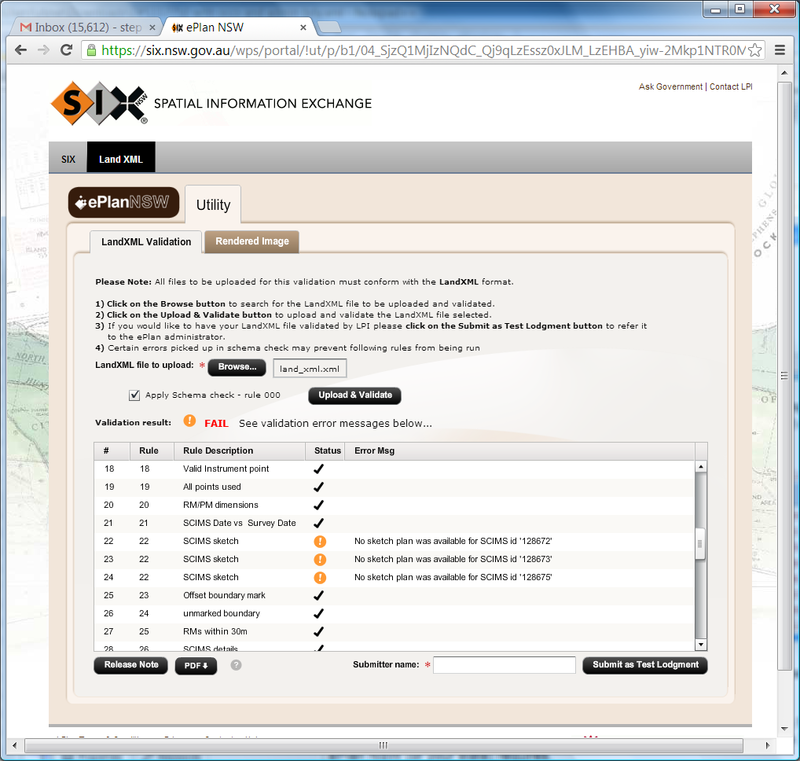 The LandXML is uploaded to the Six website and the extra validation rules are performed on the XML file. The rules are listed and whether the XML passes or fails each validation. You can see that an error is flagged on Rule 22 (Scims Check). In this case the sketch plan is lodged separately with the Survey Control Branch prior to the plan being lodged and has nothing to do with the LXML. The validation service is just reporting that there is no sketch lodged. They are supposed to lodge the sketch within a certain time. Apart from the sketch plan everything else passes the validation so you are in a position to lodge your plan. ﾷ Checks for all required and conditionally required elements and attributes. ﾷ Secondary parcel identifiers must start with an Alpha can be followed by another Alpha or numeric or character without spaces ﾖ except for lease parcels. ﾷ Secondary parcels must not be part lots. Basic topology of parcels that have a coordinate geometry. Lines must not cross lines in own parcel or adjoining parcels. Check misclose in parcels in within prescribe tolerance. Boundary marks must be placed on boundary corner. Must not be offset. Datum terminals must be labelled "A" and "B"
Checks for the connection to RMs at the terminal points of the survey where new parcels abut a road. Checks that at least 2 PM's are connected by direct connection to 2 separate points forming boundaries of new parcel.